* Oriental / Eastern massage. Much of all massage practiced in the US is a composite of the two, although Swedish remains the basis for Euro-American massage. Therapists practicing in a non-spa environment, such as Wellness Worx, often use a blend of massage techneques from multiple styles or modalities. Our Naples massage clients find this aspect to be of special interest. Swedish is the “new” age massage and is European in origin. It's the base-line massage from which the others have been developed. Our Swedish massage is light to moderate touch, is intended for relaxation, and is our economy "spa" massage. Esalen massage is a variation of Swedish that features long flowing movements promoting a feeling of freedom and continuity, as the therapist’s hands seldom leave the client’s skin. This modality requires a special level of skill, as the therapist needs to be athletic, have strong wrists and be able to twist and turn his/her hands and arms around the client’s body contour, changing direction without breaking skin contact. Esalen is the basis for our eclectic signature massage, and although it relies heavily on Esalen style massage, eclectic massage combines the elements of relaxation, deep tissue and sports massages into one fantastic massage event! Our eclectic massage is definitely an art form expressed through massage. Clients often get so relaxed they begin to dose. Just try it. You’ll never ask for Swedish again. Also based in Swedish, Deep Tissue massage is stimulating and exuberant. The predominant touch is heavy and the work is deep. Deep Tissue is ideal for those with heavy levels of tension and stress which have caused muscle spasms, knots or chronically tight muscle tissue. It is also used with those recovering from some type of injury such as from a car accident. Adhesions from scar tissue can be loosened and reduced or eliminated. Pain from pressure on nerves, as is common with the sciatic nerve, can be greatly reduced and even eliminated over time with repeated treatments. Many different methods, including trigger point, are used. Deep tissue massage can be mildly uncomfortable for anyone unaccustomed to massage. It is important you be at ease and as relaxed as possible during the treatment. This is usually easier when you have developed a good working rapport with your therapist. Often more specialized than deep tissue, sports massage also has Swedish-based roots. It can be thought of as “trainer’s massage,” because it is often used before and after the heavy physical work of sporting activities, whether football, a marathon, weight lifting, or any other sport. More range of motion work is incorporated than with other types of massage. Sports massage may be a whole body massage, or just a concentrated effort on a specific area of the body. Time-wise it may vary from the standard one hour to just 15 to 20 minutes. Sports massage is used with our fitness training clients. Hot stones have been used to warm the body in many cultures for thousands of years. In modern practice, flat basalt stones are the tools of choice. The stones may be left in place as warmers, or held in the hand while moved about. 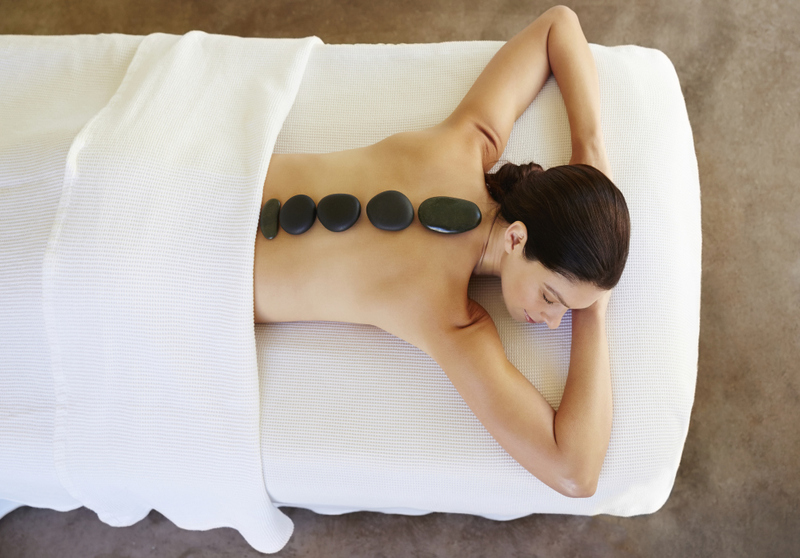 Hot stone massage is appropriate where heat is the desired vehicle to ease pain and discomfort, or to relax the body. Massage cupping is a new-age version of the ancient practice of cupping therapy, used in Asian medicine. Modern cupping procedure uses plastic cups connected to a suction pump. After a vacuum is created, the pump is removed. The skin is lubricated so the cup can be moved easily across the body. This technique is used primarily in areas of the shoulders and back. Cupping is an aid to massage in the stimulation of the peripheral nervous system, to increase blood flow to muscles and skin, and to loosen adhesions, connective tissue and knots in soft tissue. Our practice is to move the cups, pausing only briefly, rather than leaving them in place. Coverage in problem areas can be repeated. This reduces the tendency to produce redness and marking on the skin. Massage cupping is a technique, not a modality or style of massage. Thus, the time spent is just a portion of the total massage. Add a salt or sugar scrub to your Fort Myers massage. Body scrubs exfoliate the skin by using an abrasive like salt or sugar combined with an oil and fragrance. The scrub is followed by a rinse to remove the exfoliated and dead skin. When combined with a massage, the scrub can be given before or after the massage, your choice. A warm shower is a great finish to both. If you choose not to have a massage, the rinse can be followed by an application of body lotion. Moist heat applied to areas of soreness can help relieve pain and discomfort, and allow the manipulation of massage in areas of discomfort to be more effective with less attending pain. There is no charge for heat packs or for a local application of Prossage Heat when administered with any specialty massage. Minor pain can be eased with a local application of Biofreeze. Bring fast penetrating, deep cooling relief to sore joints and aching muscles. Biofreeze enhances therapy and training, giving overall comfort and long lasting cooling action as it relaxes tired muscles. Biofreeze is not applied to the entire body at one time. Biotone Polar Lotion can be used with massage of local areas to bring cooling relief to sore joints and aching muscles. It is not used close to the face, but works great with a foot massage. There is no charge for Biofreeze or Polar Lotion with any specialty massage. * We offer 50, 60 and 90-minute massage sessions. * Remember, a "one hour massage" at most massage establishments is only 50 minutes. * Prices are "flat rate": NEVER a "door fee" plus "tip". * Shower use is always included with your massage (never extra). * Master card, Visa, American Express and Discover are accepted. ​All male on male massage is offered draped or undraped. All massae for m'lady is full or partial draped. Buy Two Option: $125 for two. Club Option: $70, 1st session of the month. $60, each the rest of the month. Couples and family members may share the Club Option. We track your visists, no coupons or tickets needed. * Please ask to be enrolled as a Massage Ideal client. * One therapist in one room. * Two therapists in one room. ​​* Let massage work its magic on a prearranged weekly or biweekly schedule. * Have your massage at the prescribed time without having to shuffle appointments.